NASA and Kepler telescope researchers have just announced that they’ve discovered an Earth-size planet circling a dwarf star at a distance that would allow that planet to support liquid water. The finding was also published Thursday, April 16, in the journal Science. The announcement was made in a live press conference attended by a panel of scientists that included Douglas Hudgins of NASA’s Astrophysics Division, Elisa Quintana of the SETI Institute at NASA’s Ames Research Center, Tom Barclay of Bay Area Environmental Research Institute at Ames, and Victoria Meadows of the University of Washington and the NASA Astrobiology Institute at Ames. 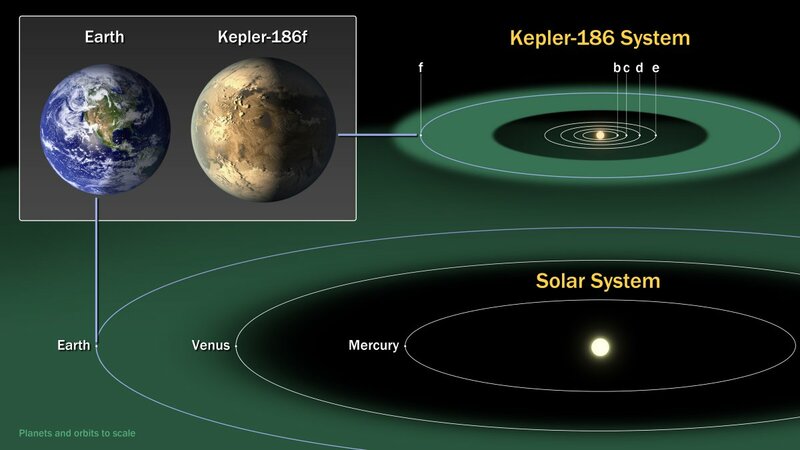 The new planet, Kepler-186f, is part of a five-planet planet system that orbits a star named Kepler-186, which is cooler and about half the size and mass of our sun. 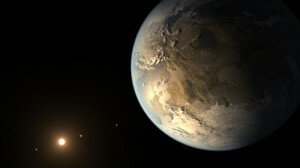 On planets that are too close to their star, liquid water boils away. Those that are too far don’t get enough energy from their star to support a climate and atmosphere similar to Earth. Kepler-186f is less than 10% larger than Earth. Scientists confirmed the size of Kepler-186f by measuring how much light it blocked as it passed in front of its host star. Scientists don’t yet know the mass or composition of Kepler-186f, but think it could have a rocky surface based on planets of similar size — like Earth.